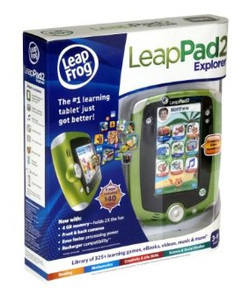 _LeapFrog have always sold their systems as a learning system first and entertainment device second. 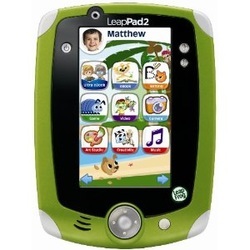 That doesn't mean that the LeapPad 2 is dull - far from it. Kids can play games, read, create cartoons, listen to music, create artworks, and much more on a tough, rugged device that's suitably 'chunky' for little hands. With a 5" screen safely enclosed in a colourful case, and with a joystick four point controller and stylus as well as a touch-sensitive screen, the LeapPad 2 is designed to survive the kind of loving attention/rough treatment most four year olds inflict on their toys. 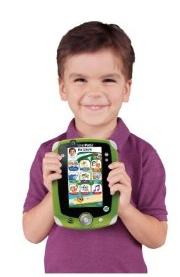 While other kids tablets are Android-based, LeapFrog has a closed app system, so parents always know apps and their contents are suitable for children. And with over 150 apps available, kids are bound to find plenty to keep them amused, entertained and educated. LeapPad2 automatically adjusts the learning to each and every child, asking more challenging questions as children’s skills develop. Additional content is available on LeapFrog Explorer cartridges, and parents can log on to a website to see details of their child's learning progress. _The jewel in the crown of LeapPad 2 must be the Cartoon Director app, where children can create cartoons and stories starring themselves. With a faster processor and a generous 4Gb of memory, the LeapPad 2 is ideal for kids who want to do more than just play games, and parents who want to ensure a tablet is for fun, not just the Internet. If your little treasures desperately want a tablet but have the co-ordination of a brick in flight, the LeapPad 2 might just be the present that will last beyond New Year's Day AND help their learning into the bargain.